The mobile number extensions are great for the big companies to group up different numbers. The extensions allow the companies to get multiple phone numbers with the same starting numbers, making it easier for the people to remember the phone numbers. Sometimes, the people find is very hard to remember or save the multiple extensions in their iPhone. That’s why we are going to share the step-by-step guide on How to Dial an Extension on iPhone and save them for later usage. 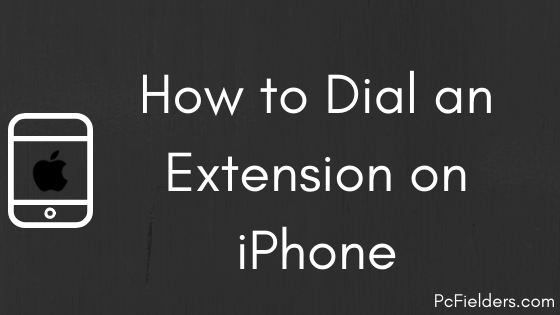 In this post, you’ll find the exact methods or the solutions, which will show you how to dial an extension and save it for later in your iPhone. The process is very easy and takes no time to dial multiple mobile number extensions on your smartphone. Just follow the steps and you are ready to roll by dialing an extension on iPhone. How to Dial an Extension on iPhone? If you going to dial an extension for the first time or rarely dial them, then the first method is for you. If you rarely dial an extension for conference calls, then you should not waste your time saving them manually. Here is the first method, which will guide you to auto dial conference call on iPhone. If you are interested in auto dialing conference call on iPhone, then you should manually dial the extension. here are the exact steps to manually dial an extension call on iPhone. First of all, open the Call application and dial the main number you want to call. Now, press and hold down the “Asterisk” or “*” button on the keypad. Once you hold it down for a few seconds, the “Comma” will appear on the Dial Pad. Enter the Extension of the number after that comma. Repeat the same steps if you have more than two extensions to dial. If not, then you can simply tap the “Call” button and that’s it! You’ve manually dialed an extension on iPhone smartphone. If you are the leader of communication in the office or the person who constantly have to engage in the conference call, you have to save the extension on your iPhone. Instead of following the process multiple times, it is easier to save an extension on iPhone for auto dialing the conference call. Here are the exact steps to save an extension and dial the conference call on iPhone. First of all, open the Contacts app on your iPhone. If you have the main number saved in the contacts, just tap on “Edit” button or create a new contact. Now, tap on the number field and you’ll see the numpad on the screen. Tap on special characters buttons which is the “+*#” button. Move the cursor to the end of the main number and tap the “Pause” button to insert the comma. After inserting the comma, enter the extension of the main number and repeat the process if you have more than two extensions. Once completed, tap on “Save” and you’re done. Now, you can dial the main number and directly join the conference call. So, I hope you’ve learned how to dial an extension on iPhone to connect to a conference call. Most of the marketers and telecommunication experts would like to exercise this feature as dialing numbers multiple times is very time-consuming. All you have to do is just to follow the exact steps mentioned in this post and you are ready to dial and attend a conference call without wasting any time.